drawn from my days in Greenwich Village with Art and Paul, and later in California when I was with The New Christy Minstrels. Some of the stuff is personal and reflective as I remember it and experienced it. History is elusive. Skip this page if you are allergic to self-indulgence or think there is only one version of history. This is mine. Shoot me. We were standing at the edge of a steep decline that dropped off a small scenic viewing spot on Sunset Plaza Drive at the very top of Laurel Canyon. The terrain dropped off at roughly forty-five degrees, down a scrub dotted, rutted and rock strewn hill to a housing project that was under construction about two hundred yards away. No answer was necessary. Cautiously waiting for the last car we could see disappear around the curve up ahead, and making sure that another wasn’t coming, we jumped over the low door panels into Barry’s orange 1955 MG TF like two bank robbers making a getaway. Barry fired up the engine and we drove off the edge of the cliff in a cloud of dust. Plainly put, Barry McGuire and I were playmates. Friendships take many forms and yield many pleasures but none are so pure nor yield such pleasures as the pleasures enjoyed by two people who spend their time in fancy for no reason other than fancy itself. True, Barry and I played music together, did concerts together, and worked hard together. But when we played together, life was the sweetest. We became friends in the Los Angeles folk music scene the year before, and now we both were members of The New Christy Minstrels, living in L.A. while we were regulars on the Andy Williams Show. When we weren’t working, it was fun time – endless talk about cars, women, inventions, you name it. We’d fantasize about cars we wanted, talking endlessly about them for months, get tired of them one at a time, then we’d switch to another. It went like this until we had driven every car imaginable in our imaginations. Mind you, this was before either of us had ever thought about smoking pot. The dark clouds of the protest movement and the British invasion were nowhere on the bright Southern California horizon, and the only stimulants you got were from your doctor with a prescription. Folk music was bursting through the cracks in the concrete up and down the West Hollywood streets. The Troubadour and The Ash Grove were the Meccas for any and all itinerant folk-singers who came through town. With our new found income from the Minstrels, Barry had bought a 1955 MG TF and had painstakingly painted it bright orange himself. It was his pride and joy. The driveway of the partially completed house led to an unmarked street, then to another, and suddenly we were careening down Doheny Drive above Sunset Boulevard, dust billowing behind us, directly toward the Troubadour on Santa Monica Boulevard, squealing hysterically all the way. Lewis and Clark could not have been more exhilarated when they first realized they had reached the Pacific Ocean. From that moment, it became our secret route to The Troubadour, which we visited regularly on Monday Hootenanny nights, and nights when our friends were performing there, which was often. At the time, I was living in Laurel Canyon in the Hollywood Hills just below Mulholland Drive. I shared a house on Wonderland Avenue with Jim McGuinn (later changed to Roger), but Jim had moved on to performing with Bobby Darin, and McGuire often slept in the empty bedroom. It was a two minute drive from our Wonderland Avenue house to the top of Laurel Canyon where it met Sunset Plaza Drive. We knew that no one worked on the half-built project on week-ends, or after five o’clock week-days, and those were the times we used our shortcut. At first, we waited for there to be no cars behind us before we drove off what from the road looked like a sheer precipice. The more we did it, the braver we became. After a while, with devilish purpose, we would drive Mulholland at night full speed and drive straight off the cliff instead of making the curve, to the horror of the motorists behind us who would screech into the parking area and rush to the edge expecting to count the bodies at the bottom of the cliff. Instead, a pair of tail lights bumping along in the dark, and faint shouts of laughter floating through the dust cloud that surrounded it. Had cell phones been invented then, we never could have gotten away with it, but they hadn’t. On several occasions, someone would be visiting the house, and the conversation invariably went like this. “Meet you at the Troubadour” – they would say. “Race you there” – we would answer. “In that old British putt-putt?” – they would say. “Why not?” - we would say. We’d all jump into our cars like fighter pilots scrambling for a mission and with shouts of glee we’d swing a screaming U-turn and head in the opposite direction up to our spot to their total disbelief and distraction. When they pulled up to the Troubadour, Barry and I would be leaning on the hood of the orange MG smoking cigarettes and laughing at their bewildered faces. Those were days lived in the timeless pleasure of friendship and the excitement of newness. Sure, we had other adventures worth the telling, perhaps in another chapter. Time and events move us along the paths of living and we forget. 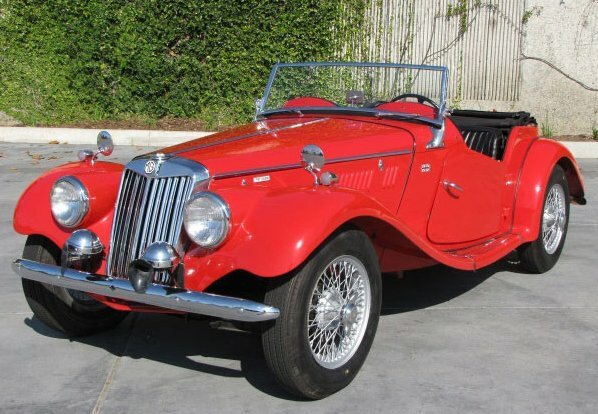 But I must admit, sometimes at night when I drive a curvy mountain road in my goings and comings, my headlights flash on a blind curve, and suddenly I’m in a 1955 MG TF on a warm summer night, my friend in the seat next to me, and we’re headed for the cliff. I chuckle out loud every time. Don’t worry mom, if you’re up there listening, I make the turn. November 1, 1958 A CubanaVickers Viscount en route from Miami to Varadero to Havana is hijacked by Cuban militants. May 1, 1961 Antulio Ramirez Ortiz hijacks a National Airlines flight from Miami International Airport to Cuba. Ever see a DC3? It’s a stubby airplane that holds about twenty-seven passengers. When the craft rests on the runway, its nose points up at about a 35 degree angle while the tail sits about three feet off the ground on a single wheel. Passengers climb aboard on steps that are built into a rear door that swings out suspended on two cables, one on each side of the steps. When everyone is in, the door folds back into the plane, steps and all. There is no other entrance or exit. Everyone boards and leaves through that door - passengers, pilots, and one stewardess. The DC3 is noisy and slow, but with a little luck you can land it in a cornfield if you had to. Even though it has been retired from most regular airline use, hundreds of them are still in service. In 1962, everyone who flew was aware of the remote possibility that their flight could be hi-jacked to Cuba. It had happened three times in the previous three years and although some fears disappear in the light of day and reason, our secret fears of flying always surface as we buckle our seat belts. When you last flew, did you check the other passengers to see if any of them looked suspicious? Of course you did - we all still do. Today it’s ‘Arab’. Back then it was ‘Hispanic’. On this particular morning, nine sleepy New Christy Minstrels boarded a Lake Central Airlines DC3 at Chicago’s O’Hare Airport. It was late 1962, and we had finished a season of appearances as regulars on the NBC’s coast-to-coast show, The Andy Williams Show. Now, we were reaping the rewards of fame with night-after-night college concerts - up in the wee hours into cars to the airport and onto a plane to the next show. We were big-time in the mid-west and we were forever changing planes at O’Hare for a Lake Central Airlines DC3 to any town that had a college and could afford us. Lake Central Airlines serviced all the cities around the Great Lakes not serviced by the larger carriers. This day, things were no different. Bleary-eyed and coffeed, we trudged onto the tarmac like a family of ducks in a line, and along with the other passengers, climbed the five or six suspended steps into the sausage fuselage of a Lake Central Airlines DC3, and found our seats. I found an aisle seat on the left side of the plane facing the front about three rows back from the cockpit. In those days, the cockpit doors were just that – doors. No lock, just a handle. Across the aisle to my right, Nick Woods, dark shades, head back, napping. A new sound. Air rushing. Turn around, and sure enough the damned door has swung open and is hanging outside the plane as O’Hare slowly retreats into the distance and our DC3 continues its climb, totally unconcerned that its fly is wide open. Me: “Come to think of it, it didn’t…could it have been…? Clarence: "Well...I don't know. Isn't that what you're supposed to do?" Ever see an old lady in a car beside you on the freeway, eyes wide, jaw clenched and mouth open in terror, clutching the wheel in a death grip? Well that was her. Poor thing, her first flight and she forgot to lock the door. Now she was strapped in her jump seat with the ‘old-lady-on-the-freeway’ look on her face. Nothing short of a cattle-prod (tasers hadn’t been invented yet) or a crow-bar could have moved her. “I’ll tell the captain”, shouts a tenor solo. Did I say Hawaiian? Well, maybe a little Hispanic looking. Maybe just a mite. Now, not too many people know this about Nick Woods. He was quiet, usually slow moving and gentle to look at, but trust me, the guy was a coiled spring with physical strength and athletic coordination you’d never suspect. Nick was a cat. I’ve seen him water ski at full speed with only one foot touching the water, one hand holding the line and the other straightening the lock of hair that forever was falling into his field of vision so casually, it looked like he was standing in front of his bathroom mirror. I once saw him ‘stroll’ out onto a tenth story window ledge in a New York hotel to retrieve a piece of paper that had blown out of his hand like he was bending over to pick up his socks. No one knows how it happened, least of all Larry, but before you know it, Larry is sitting in Nick’s seat with a puzzled look on his face and Nick is in the cockpit. That was it. Later, I asked Nick what had happened. That was it. We circled back to O’Hare and landed, closed the door and took off again. I haven’t thought about that incident in years. I suppose if it had happened today, it would be all over the news channels and someone would be suing the airline for severe emotional distress and making a book deal. But some people just take things as they come, and do what they do without fanfare because it’s what you are supposed to do. It was Peter Yarrow, and we were in the apartment on Fifth Street off of Second Avenue in Manhattan that Paul Potash and I shared. Our second Columbia album, ‘Hangin Drinkin and Stuff’ had just been released and was going nowhere, The Brothers Four had suddenly become the darlings of Columbia, winter was upon us, and Paul and I had started looking to the budding west coast folk scene for salvation. We had met Peter at the Café Wha? 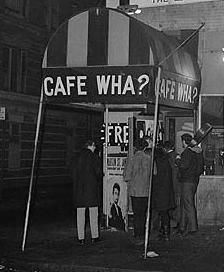 in Greenwich Village a year earlier. We sang nightly and Peter and I had formed a friendship. When he first hit town, I had gotten him a gig replacing me in an Israeli folk-dance group as the guitarist/singer. Now he was in the process of forming a new group, Peter Paul and Mary. Peter Yarrow is pure folksinger top to bottom. I remember marveling at him when he’d solo at the Wha?’. Once he started singing, the funny looking Jewish kid disappeared. There was only this energy on stage rocking back and forth as the music surged through the room. If I ever had visions of following in the footsteps of my hero Pete Seeger, I was sure that Peter Yarrow would be in front of me in the line. It was 1961. Folk music was spreading and money was hunting for talent. No wonder Albert Grossman singled Peter out and paired him with Noel Stookey. Noel was also a regular at the Wha? and his comedy, rich voice and sincere talent made him a natural. But they needed a girl to round out the package. I remember having been impressed by Mary Travers after seeing her at a midnight concert at one of the local Village theaters a few weeks earlier. When Peter asked me if I knew any girl folk singers one night while we were sitting at the bar at Minetta’s Tavern across the street from the Wha?’, I asked if he’d heard of her and that he should look her up if he hadn’t. Now I have no idea whether he did right then, later, or because of me at all, but sooner or later they found each other. That was the way things happened back then. We were all ingredients in one big cauldron of soup called the folk scene and who knows who was responsible for what, but things happened the way they were supposed to I suppose, and it’s a lucky thing because otherwise there’d be jerks standing on stage every night taking credit for discovering Elvis. Actually, there are. Anyway, Peter grabs a guitar, yanks out a sheet of paper, unfolds it, and sings “Puff The Magic Dragon” to me and Paul. What’s so controversial? we asked. That’s how naïve we were. Peter had written it as a children's song and I guess there was some question for some people but to us it was a children's song and we always thought so. Knowing Peter as I did then, I still think so. We loved the song. I mean l-o-v-e-d the song. Not even a question.Within a day, we had an arrangement, and within the week we were singing it at Mike’s Pub in Boulder, Colorado. It became our theme song. We even had a fan, an exchange student at U of C who translated it into Swedish. “Puff Der Hemske Dragon”. I’ll post it if I can find it. A month later at a sold-out concert at the University in Boulder, we sang it and at the time, we had no idea someone was recording the concert. After the concert, we headed for Los Angeles, our new song, salvation and summer in our dreams. I was standing next to the back door of the Troubadour in Los Angeles waiting to go on with Paul. Dickie Davis was holding the pay phone receiver in his hand. Some years later, I found out that the recording made at the 1961 Boulder concert had surfaced on a bootleg record label. Click the link below to hear it. And there you have it. The true story so help me God. Oh yes, Peter, if you are reading this, please let me know where to send the royalties. I’ve lost your address. I think that everything in show business starts with a phone call. The first was from Jackie in 1961 asking me if I was interested in joining a big group that Randy was starting called the New Christy Minstrels. Jackie was still one third of the Randy Sparks Three even though she and Randy had recently divorced. Oh yes, Jackie and I were at the tail end of a brief fling that had mellowed into a comfortable friendship, and Randy wasn’t one of my buddies so it didn’t make much difference to me. Art and Paul had split up the year before, and I was writing songs with Walter Schorr for one of Henry Mancini’s publishing companies, playing some dates with The Smothers Brothers, and running the hoots at the Troubadour on Monday nights. Life was good and I wasn’t too excited about working with an ex-girlfriend’s ex-husband, but she painted a pretty rosy picture - a record deal that Columbia had already agreed to and yada yada… Besides, nothing I was doing was making any money to speak of and frankly, I was broke. Anyway, that’s a different chapter that I haven’t written yet, but that’s when the whole shebang started. This call came from an unfamiliar voice. Someone named Robert Zucker calling from Queen Creek, Arizona, somewhere near Phoenix. Now some people are Bobs and some are Roberts – this one sounded like a Robert. “A concert featuring the original members of the New Christy Min…..? Pardon me, but who did you say you were?” I listened – pulse rising imperceptibly – was I getting the flu again? Cheeks seem warm, and what’s that buzzing in my ears? …pulse now kicked up to blues tempo… cheeks and ears pinging the back beat. Clarence! Quick Artie, call Clarence! He will know what the heck is going on. He’s been trouncing around the country with Randy and his whatchamacallit bunch for a few years now, and besides, Clarence doesn’t know how to lie. “Clarence? I just got a call from a guy named…oh really? And you’re sure they want me to be included even after SierraLand? Did someone get religion or something? You’re kidding! … yes… well maybe… but why not? As long as it’s a one-shot deal. It is a one-shot deal, isn’t it?.. when? I don’t know but I can probably arrange the time off…I mean why not,.. hell…why not?" Tell me something. What would show biz be without the thrill of possibly having the winning lotto ticket handed to you from the other end of the phone after all? Robert seemed a likeable guy (still is), and he also seemed to have the business part of things comfortably in hand, and the story seemed genuine. So, trying not to let the thumping in my throat get too loud, I made the arrangements to take some time off so I could be in Queen Creek on the Wednesday before the concert. Kettle drums in my chest now…. The concert was scheduled at the Performing Arts Center in Queen Creek, Arizona, and through some quirk of fate, everyone who was available agreed to come. Sometimes the planets line up that way, especially when the cosmos is hiding a sucker punch behind its back. It had been forty-three years since we had all stood on a stage together, and it had been ten years since the 1994 heartbreak at SierraLand in Oakhurst, California. Frankly, though we hadn’t really been in touch, we all missed each other. For me, it was a miracle that it was even possible. In my wildest dreams, I never figured that I would ever lay eyes on these people again, let alone stand on a stage with them. Curiosity and heart thumping adrenalin drew me into it like a moth to a flame. Make no mistake - standing on stage in a large theater, an audience rising to its feet in thunderous applause is a downright intoxicating and addicting drug. It should require a prescription. It makes politics understandable and it’s probably why show biz people seem to be drawn to the more theatrical candidates. It’s a good thing few experience it directly or the world would be in bigger trouble than it already is. The first rehearsal day loomed…new strings on the guitar. Which one do I bring? The Martin or the Goodall? As for a banjo, the only working one I had was a Kay I had purchased on ebay. What the hell, it worked. Besides, it was a banjo... My voice had grown stale and dusty from not singing, and could only be made useful after fifteen minutes of non-stop screaming in the shower every day which scared the bejeezes out of Iggy and Rockett, my cats, and sent my neighbors to the phone to call 911. Request for time off at work, plane tickets, rental car, hotel reservation. I didn’t even have a clue whether I was going to break even on this one, but I was leaving nothing to chance. I pulled up in my rental car behind an impressive massive southwest style building at the large doors marked ‘Load In – Artists and crew only’. I grabbed my guitar – I had chosen the Goodall - my banjo, such as it was, and walked inside to meet my old life head on. One by one, they straggled in.. hugs, screams, smiles, tears. Jackie Davidson, Gayle Caldwell, hair and makeup askew, crying in each other’s arms like long lost sisters. Dolan Ellis had finally agreed to come and he was there, cowboy hat, boots, silver and turquoise, forty years of wearing the title of Arizona’s Official State Balladeer – and looking every inch of it. Of course, retired Captain Clarence Treat of the Los Angeles County Fire Department had arrived earlier and was already on stage hooking up microphones, testing levels like it was just another day at the races for him. At the back of the room a balding, bearded man hovering over a mixing console, watching everything over the top of his glasses like a parent. Robert. He looked just like I imagined him. And there was Randy. Or was it Mark Twain? White, flowing mane and handlebar moustache, sitting back on a folding chair in the center of the stage with a smile on his face that I couldn’t decipher. Was he really smiling? Hard to tell. I should have thought about it a little more carefully. Robert was clearly in charge. He had everything organized and scheduled. Where we were staying, eating, rehearsal times, etc. It was a pleasure. Each step of the way, things were beginning to feel like it used to in the old days. The feeling that we were stars who were finally getting our long overdue well-deserved recognition was starting to sink in and it was feeling great. Maybe, just maybe this time… Of course, everyone kept glancing over at Randy. Well I’ll be darned! He seemed to be going along with everything like it had been planned this way. I forgot to check his left foot to see if it was on the brake pedal. And of course, on stage tuning and microphone testing were Lori Brandon, Dave Rainwater, Todd Hollowell, Ron Wilburn, Chuck Cole, and Becky Jo Benson. ……………………………………Who? I had no clue who these people were. All I knew was that these strangers were younger than us originals by at least a generation, and that they were connected to Randy by an invisible, palpable umbilical cord. First of all, they knew all of ‘our’ songs and I’m sure everyone, being the natural egoists that performers are, immediately began calculating who was going to sing what when it came to the actual show. Poor Gayle’s brow furrowed so deeply in concern I thought it would remain that way for life – Gayle never could hide what she was thinking. Jackie’s smile froze. Me? I was so taken with watching these two darling ladies I had missed so much, I didn’t give a hoot who sang what. But clearly there would be too many people on that stage and I’m sure some of us wondered about it, but no one said a word. Of course Dolan rode through the cloud and didn’t miss a smile or a beat. Class act. Clarence? No one could match either Dolan’s or Clarence’s vocal contribution and they were off limits to music theft. It had been a long time. Randy had created The New Christy Minstrels in 1962, then sold the group and the name in 1964. We had made quite a career and a name for ourselves for several years without him. Then in 1994, SierraLand had kicked the stuffing out of us as an independent group, and we had scattered to the winds. By 2005, Randy was the only Indian standing who had the remote authority to claim the name and there he sat, his victory banner pinned across the rear of the stage declaring in huge black letters against a white background. If the writing was on the wall, the banner covered it up real good. Me and Randy Sparks. (This may take a bit If you don’t care, skip this part. )Randy and I made some pretty significant music together, and I’m proud of every lick and arrangement we did, every note we sang, and every song we wrote together. As you may have figured out already, Randy Sparks and I are, and always were, oil and water. We probably always will be. It’s no one’s fault - just human nature. First there was the Jackie thing. And if that wasn’t enough, there’s more. Randy’s a talented singer/songwriter from Kansas who saw folk-music as a way to get rich by holding all the cards and owning all the music. His primary reason for creating the Minstrels was to have a group as a showcase for his songs. He sure knew what he was doing and how to do it. Also, Randy knows more American historical trivia than the custodian at the Library of Congress. Once he’s on the scent, he’ll go hundreds of miles out of his way to research some obscure character. Like the camel guy, Haj Ali (Hi Jolly). I’m sure that if he lives long enough, he’ll have our entire history set to music. The man’s an engine that doesn’t quit. Me, on the other hand, I’m a Jewish kid from Brooklyn via Greenwich Village – grew up singing protest songs, voting for guys like Adlai Stevenson, and worshiping songs that inspired me no matter who wrote them and was collecting the royalties. (I had no idea how the money part worked.) I idolized Pete Seeger and Woody Guthrie (still do), and spent three years with Art and Paul personalizing every song we touched. I knew hundreds of songs from my time in the village, in college and high school. Make no mistake, I wanted to hit the jackpot too, and when I hooked up with Randy, I thought I was on the gravy train at last. It didn’t take long for him to let me know that it was his train and his gravy. 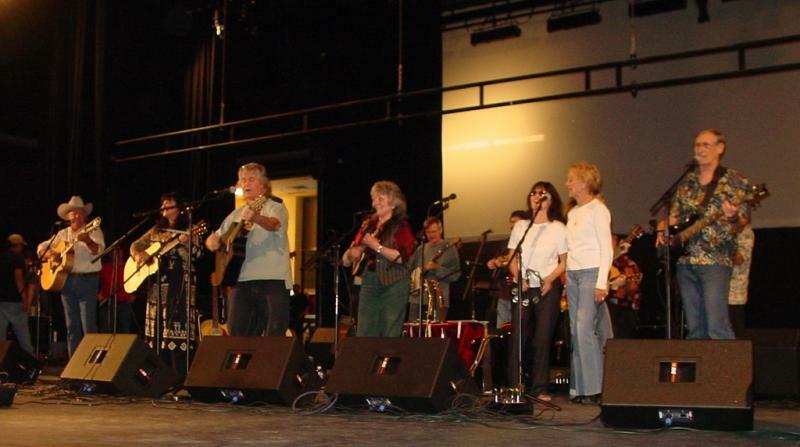 My problem was that I thought that we could become the greatest American folk music group of all time especially with talent like McGuire, Nick, Dolan and Larry, and sing all the great folk-songs, and not just Randy’s songs, some of which I thought were silly. I thought he was selling us short by not turning us loose on all the great music out there. You know, like what Peter Paul and Mary were doing. That wasn’t Randy’s intention at all and that’s pretty much where we ran into trouble with each other. Randy must have thought that I was some sort of revolutionary who was trying to subvert his group. Give me a break. I just wanted to make the music better and more diverse. But by the time Randy finally sold the group to our two managers in the mid-sixties, it was too late. The music scene had changed abruptly in 1964 with the 'British Invasion' and, like many other folk groups, we were suddenly passé ...stuck having to be caricatures of ourselves. Ever see ‘A Mighty Wind’?" That’s it in a nutshell. Now here we were, in Queen Creek Arizona happy to be together again. I figured the years had mellowed us all, the sixties were over for everyone, and maybe things would be different. Robert had glued humpty dumpty together miraculously and it felt good with him running the nuts and bolts of the organization. Everyone seemed to defer to him. Even Randy, and I was glad and still surprised that Randy seemed to be accepting everything so casually. Besides, we had all come to do only one concert right? Who did I think I was I kidding? Front row: l to r: Dolan Ellis, Lori Brandon, Randy Sparks, Becky Joe Benson, Gayle Caldwell, Jackie Davidson, Clarence Treat. It was around the time that Art and Paul were making a stir in the Village. We never knew exactly when or how we became noticed. All I know is that Paul and I took the songs we liked the most, sat in our little one room railroad apartment on 5th Street and Second Avenue and mashed the songs endlessly, twisting them and kneading them, one song at a time for weeks and weeks on end until we were happy with them. We had no goals other than to make each song something no one could mistake as being other than ours. We dramatized the dramatic parts, took liberties with phrasing, voicing. We would go downstairs to the coffee shop on the ground floor of our building and to the little one across the street and sing them from our chairs and couches to anyone who would listen (any decent coffee shop had to have a couch back then), and suddenly people were talking about us. I remember being invited to a party during that time. The guy leaned over like a conspirator and whispered , “…it’s going to be a great party, Art and Paul will be there…” At that moment I knew what it felt like to be a star.